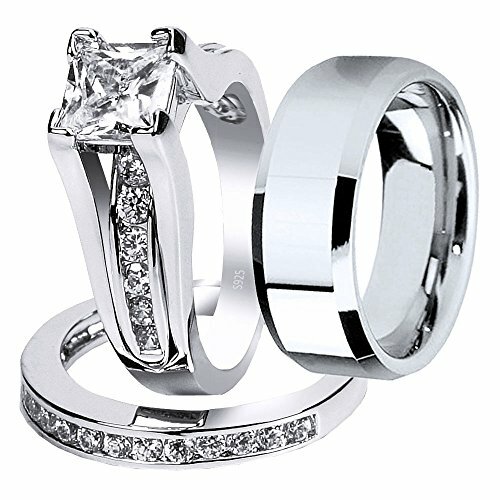 This is a beautiful 3 pieces top quality wedding engagement ring set. The feature of engagement ring is a 6*6 mm (1.26 ct) princes cut stone in center with a prong setting. And alongside stones are 13 round cut stones in a channel setting. The feature of matching engagement ring comes with 15 smaller round stones in a channel setting. The total carat weight is 2.1 CTW (approximate). The metal of men's ring is made from stainless steel. The ring is 8mm of width and 2-2.5mm of thickness. WOMEN'S RING: 2.10 CTW Princess Cut Simulated Diamond Cubic Zirconia Sterling Silver Classic Wedding Ring Set; Solid Sterling Silver .925 Stamped with "925". OCCASION USE: These rings can be used for engagement, promise or anniversary. It's a great gift for someone that means a lot to you and that you want to show how much you appreciate it. GIFT BOX INCLUDED: The Rings will come in a nice gift box. Ready to give to your partner. 60 DAY MONEY BACK GUARANTEE: 100% satisfaction and money back guarantee. 100% nickel-free. Hypo-allergenic, Never Green!